Our Segmented Dome rooflights feature curved double skin polycarbonate glazing contained within polyester powder coated aluminium frameworks. These rooflights are suitable for all types of flat or low pitched roofs. They provide great visual impact and are often used as centrepieces or points of focus for large internal spaces like halls or atria. 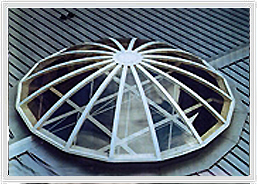 Our Segmented Dome rooflights are made to order in sizes to suit specific requirements, for installation to structural kerbs by others. 3mm UV coated polycarbonate inner skin, 3mm or 4mm UV coated polycarbonate outer. The glazing is Makrolon Mono Longlife UV resistant polycarbonate sheet. 10 Year warranty on breakage, excessive yellowing and loss of light transmission. Fire Rating: Makrolon 2099 when tested to BS 476 Part 3 is rated AA surface spread of flame to BS 476 Part 7 Class 1. Class O material to Building Regulation 1985. TP(a) rigid classification as described in approved Document B of Building Regulation 1991. Height in centre dependant on size of dome required. Clear – 90% Opal – 60%. In accordance with Lareine Engineering recommendations.